BELLVILLE, Texas – There is a special feeling that happens in the arena at the Austin County Fairgrounds. There are many adjectives that describe the aura that surrounds one of the best rodeos in southeast Texas each fall, but the cowboys say it best. 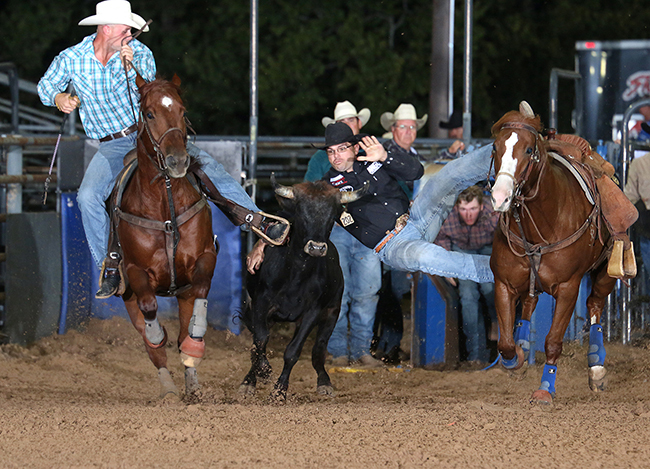 Look for Talley to return to Bellville during this year’s rodeo, set for 7:30 p.m. Thursday, Oct. 11-Saturday, Oct. 13. He will be among dozens Wrangler National Finals Rodeo qualifiers who will be part of the world-class event. For years, Bellville’s rodeo was one of the best-kept secrets in the Professional Rodeo Cowboys Association, but word is spreading. Now there are people talking about why the event could be in the mix for the PRCA’s Medium Rodeo of the Year. “I think it’s because of the growth it has shown over the past few years,” said John Gwatney, the event’s chute boss from Marquez, Texas. “How do you make one of the best county fair rodeos better? You add to it. That’s true. Tuckness is the reigning eight-time PRCA Bullfighter of the Year; Polhamus is a four-time Announcer of the Year; Sandy Gwatney is the 2016 Secretary of the Year; Hilton won the inaugural Music Director of the Year in 2017; and Sosebee was the barrelman at last year’s NFR – he will be the featured clown/barrelman in Bellville this October. It’s also one of the first rodeos for the 2019 season, so it’s an important stop for contestants to kick start their chances of having a successful campaign just two weeks after the existing regular season concludes. Southeast Texas is beautiful in October, with mild temperatures and a chance to be part of a community event. That and the $4,000 in committee money that’s added to the purse in each even are drawing cards for rodeo’s greatest starts. But it goes beyond that. The hard-working committee is made up of volunteers who donate their time and their resources to make the Austin County Fair’s rodeo a big deal, not only to the local fans but also to the contestants that compete for a living. “One of the biggest things I’ve seen in my time is that they redesigned the arena to make it better for the cowboys and the livestock,” John Gwatney said. “They want to make it better, and they work hard to make it better. It’s a community that comes together for a common cause, and it reflects in the showcase that is Bellville’s rodeo. And that’s why there’s a buzz about the Austin County Fair’s rodeo being one of the best events in ProRodeo.